You understand that multiple consecutive "Service Tasks (Data assignment)" are integrated into one Step, and the Workflow diagram has become neatly. In the Workflow diagram of "after integration", the Step (human task) that people operate is more noticeable, and it is easy to understand for the person in charge of operating as well. 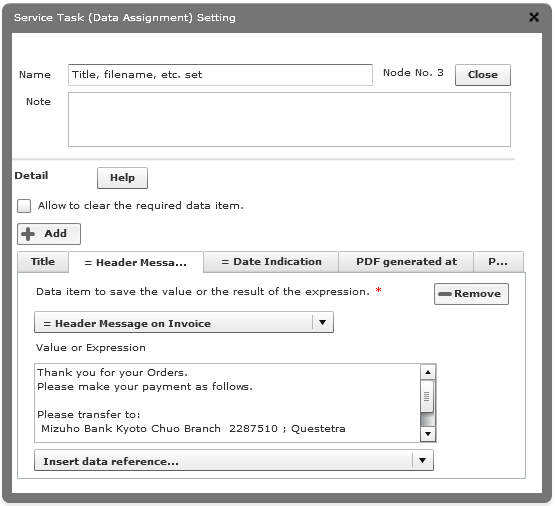 On the other hand, since multiple processing is done in the auto-step (Service Task (Data assignment)), the contents of each processing are a little difficult to understand. This may also be true if you are processing with a script using "Script Task", or when using "Service Task (Add-on)". It is necessary to devise a way how you name the automatic Step. In the Step of "Title, filename, etc. set", inputting to Data Items is done automatically. 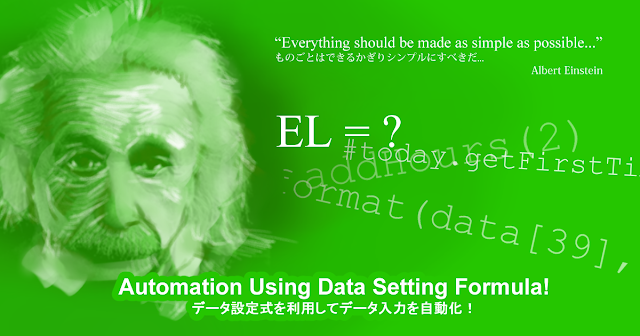 There, "Data setting formula" that I introduced in the article before is also active. With "Invoice Issuance Date" alone, it would be "2018-07-17"
Specifying its format to "2018年07月17日", then set it into "= Date Indication"
Set "Invoice Filename" according with "Process ID", etc. Possible to clear an entered value by setting nothing (blank) in "Value or Expression"